Each pot seeks its own place. The place found where a cup sits on a saucer, within a family of bowls, the horizon and visual landscape created by a group of bottles, or on one’s own kitchen table. The boundaries of such places are both defined by and crossed by familiarity. We find comfort in what we understand and are intrigued by what we do not. Function plays roles in creating a sense of familiar that works to invite use and understanding. Coffee finds its way easily into a cup that is simple and comfortable. Within the relationships of the pots to one another a dynamic is built that clearly describes a map for where one pot should go; on the saucer, next to the similar form, in your hand. 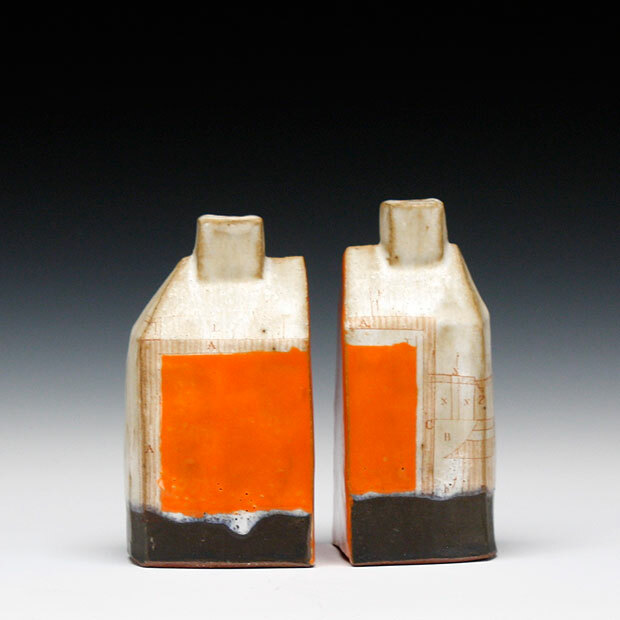 Familiarity can also be found in the landscapes that these series or sets of pots create that is similar to a group of buildings on a horizon. I am inspired by the landscapes and structures that have surrounded me during my life. I grew up in the mountains of southwest Virginia and have lived in the middle of a city. The silos, corncribs, wooden barns and rural structures that time has weathered and pulled influence my forms, spaces and the relationships of the pots to one another. I am fascinated by the water towers perched atop tall city buildings and the limited space that has forced the buildings to be more vertical. 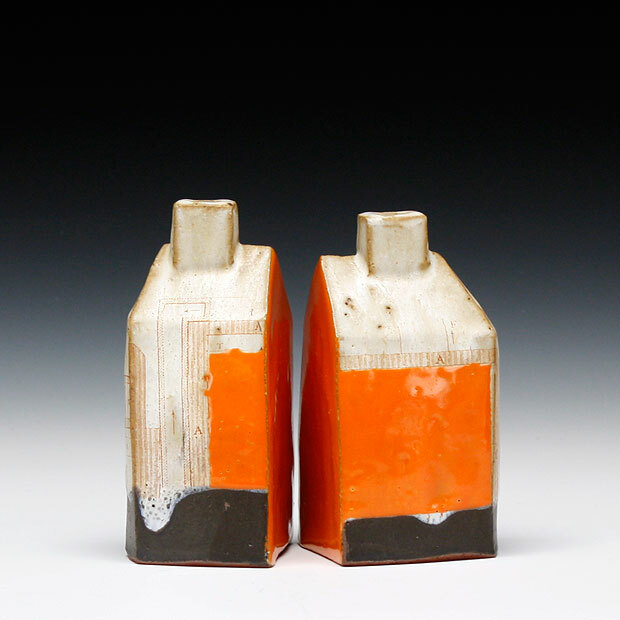 The glazing and patterns are derived from old tools, the bold lines of a plowed field or a weathering wall. Color brings each piece to life, beginning with the color of grass in the winter or the earth I remember playing with as a child and adding to it a cardinal or a redbud in bloom. I hope to direct the pots to find an intimacy with a moment; the moment of touch, frozen in time by the heat of the kiln or the moment of use. I would like to make pots to enter into a person’s life and to heighten an awareness of time and elevate an experience of place. Functional pots have the ability to be a part of a home in an intimate way, adding a sense of character and individuality to the daily habits of eating and drinking. Pots can participate in and affect their environment, transforming the act of buttering toast into a ritual or remembered experience. It is my hope that each pot brings its own unique experience to the user and offers a moment of reflection and joy.